Rough green snakes are inhabitants of the Laurel Lakearea. They grow to a length of 40 inches. The dorsal color is peagreen while the belly is pale green to white. Scales are keeled in17 rows at mid body. Rough green snakes have narrow heads with large eyes. The roughgreen snake rarely bites and is non-aggressive. It prefers sunny openareas that have berry patches and dense thickets for cover nearby.The green snake's diet includes insects, mostly crickets and grasshoppers, insectlarvae, and spiders. Rough green snakes come out of hibernation and become active later. This usually occursin early May in the Laurel Lake area. Following mating, femaleslay eggs in loose soil or in rotted wood. The young hatch in 6 to 12 weeks.They become fully mature in 1 to 2 years. 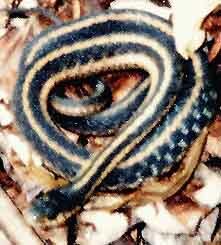 These snakes appear more numerous inlate summer when they become more active. Rough green snakes are not seen in this area after late October.